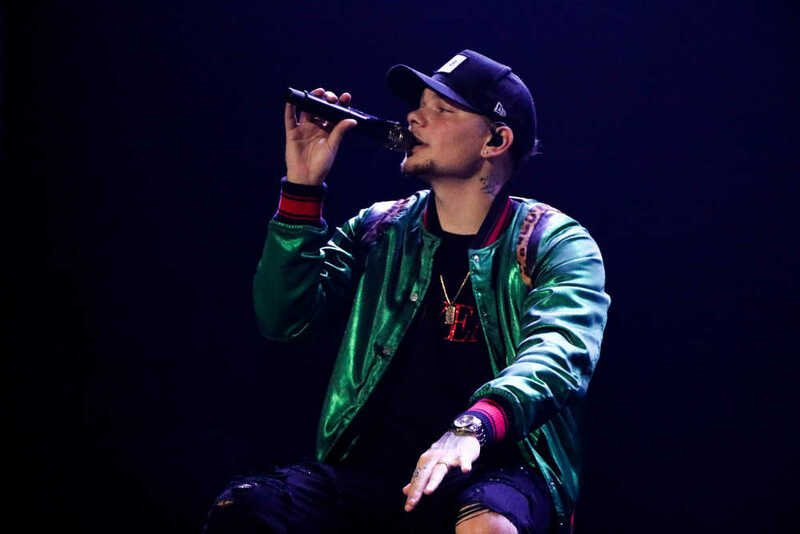 Country artist Kane Brown performs at the Show Me Center on March 1. He is currently traveling the country on his Live Forever Tour. The tour comes after his second album, Experiment. Country artists Kane Brown, Granger Smith and Jimmie Allen performed Friday, March 1 at the Show Me Center for Brown’s Live Forever Tour. Black curtains went up around the stage at the start of Kane Brown’s set. The crowd hushed as a guitar riff swelled and the background screen began to flash in red and white. The curtains dropped to reveal Brown elevated on a flashing platform in a green jacket and sparkling black jeans. Brown played a couple of songs and then introduced himself. He talked about his wedding in October 2018 and how he struggled growing up in Georgia. Brown encouraged the audience to pursue their passions through life’s obstacles. “No matter what you go through, you can do whatever you want in life,” he said. He shared some insights about his personal life such as how his dad influenced him growing up and how he wanted to do the same for his 4-year-old son. After Allen concluded his set, stage hands set up an eight-panel display for Smith. The panels lit up to show video footage which coordinated with Smith’s performance. He had an energetic presentation on stage, dancing to the beats, jumping on coolers, throwing drinks out into the audience and even taking off his shirt at the end of his set, which he also tossed out into the crowd. Smith performed his hits “Backroad Song,” “Don’t Tread On Me,” “Happens Like That,” “If the Boot Fits” and “You’re In It.” Smith is known for saying “Yee Yee” in public, which he did several times on stage. During a rendition of Earl Dibbles Junior’s “The Country Boy Song,” Smith tossed an acoustic guitar wrapped in a camouflage material with “Yee Yee” taped in lime green on the back. Smith said “Yee Yee” means live life to the fullest. Allen, Smith and Brown interacted with the crowd throughout their performances, taking pictures and shaking hands. Brown will appear next in Texas.